PSV Eindhoven star Memphis Depay has confessed that he dreams of making a big transfer to one of the major leagues – which will be music to the ears of Manchester United and Liverpool whom are both interested in securing his signature. 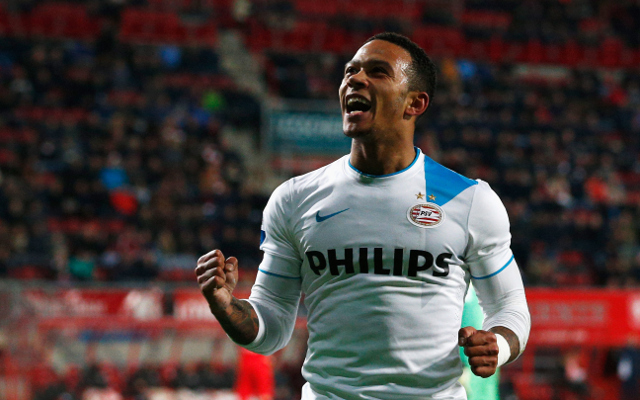 “It is a dream to make a transfer with such a big impact,” Depay was quoted by the Manchester Evening News as saying. “But as I already said, there is a lot of speculation and a lot of stories, but I don’t know how things will work out, so let’s wait and see,” he added. Depay caught the eye at the 2014 World Cup in Brazil, netting twice as the Netherlands reached the semi-final, and has continued his excellent form for PSV – scoring 24 times and registering four assists in all competitions. On Monday 20 April, Sky Sports confirmed that Manchester United had enquired about Depay’s availability, in what was a sure sign that Louis van Gaal wanted to wrap up a deal quickly when the summer transfer window opens. However, Liverpool could be set to battle their English rivals for the Netherlands international as, via The Independent, Brendan Rodgers spoke highly of the forward’s talent, and remained tight lipped on any transfer gossip.